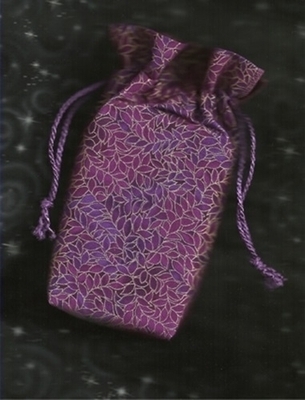 Double Draw Tarot Bags - Premonition DD Tarot Bag - Tarot Bags, Tarot Cards, Cloths, & More! There's a lesson in the interconnected pattern of metallic gold edged leaves on this purple and fuchsia Premonition bag. It teaches us to look beyond the expected to see the unusual, and serves as a reminder to be alert for warnings that come our way. Observe alternate patterns to make sense of what you see, hear, and feel. Expect the unexpected. React to your premonitions.